If Sam Allardyce thought the storms clouds gathering over his tenure as Everton manager were clearing away, becoming the first side to allow Burnley to come from behind for victory under Sean Dyche will just about have sealed his future. Another week of soul-searching by thousands of Blues over the (lack of) direction the club is headed in saw Turf Moor witness the usual sold-out visitors section. We might not be very happy with our team, our manager, our Board of Directors, even each other at times, but Evertonians travelling following is unrivalled. Sean (gravel-chewing voiced) Dyche has worked wonders with the Lancashire club and,despite no win since December has taken them to Premier League heights even the most ardent Burnley fan could surely only have dreamed of last August ahead of the campaign beginning with a staggering 3-2 win away at defending champions Chelsea. Hoping to complete a league double over the Blues in his 250th game in charge, Dyche, currently the third longest serving manager in the Premier League selected his line-up: Pope, Lowton, Tarkowski, Mee (c), Ward, Lennon, Cork, Westwood, Gudmundsson, Hendrick and Barnes. Under massive pressure, if only from thousands of supporters, Sam Allardyce simply had to put out a side with the sole intention of winning – anything less was highly likely to be greeted with howls of derision if not insurrection in some manifestation. The team sheet for this crucial game of what many hope with be a seriously shortened engagement certainly gave some hope for an attacking performance as it read: Pickford, Martina, Keane, Williams (c), Coleman, Gueye, Davies, Sigurdsson, Walcott, Calvert-Lewin and Tosun. A bright start by both sides saw Burnley throw some early crosses into the Everton box for Jordan Pickford to deal with especially a terrific right wing effort from Lowton that Coleman cleared to Gueye who calmly turned to evade pressure and clear to midfield. Lennon with a cross for Barnes to lay back, saw Gudmundsson blaze his hurried shot well wide, but the home side had settled the better in the opening ten minutes. Everton had the first real scoring opportunity on 14 minutes as DCL found Sigurdsson and he danced his way to the bye line before cutting the ball back invitingly for Walcott or the onrushing Davies with the former somehow blazing over from eight yards when it looked easier to score. Burnley responded with Lennon firing a hard cross into the box that came out to Cork who fired his shot over under pressure from Tom Davies. The next Burnley attack came down their left flank and Gudmundsson fired another low cross that Pickford did well to fingertip away to safety. Everton opened the scoring in the 20th minute as Burnley failed to clear a Sigurdsson free kick properly and when the Icelander linked with Walcott on the right, the cross was flicked on by Seamus Coleman for the Cenk Tosun to confidently bury his maiden goal with a perfectly placed header low into the near post corner past Pope. DCL was booked on 26 minutes as he went in slightly late on Ward. With Lennon again causing the Blues problems down their right, a quick break from defence saw Walcott and Tosun link with Walcott unable to get enough on a close range effort to beat Pope. The game swung back down the Everton end with a cross from Lowton met by the head of Barnes only for an acrobatic diving save from Pickford – in front of the watching England manager Gareth Southgate – to deny him an equaliser. Westwood was booked for a clumsy challenge on Davies on 36 minutes before Walcott escaped a yellow card for an awkward collision on Ward. From the free kick, the ball was swung to the back post where Lennon arrived, but Mee was unable to get a telling touch and Pickford was happy to gather the loose ball. With the half time whistle, Everton would have been happy to take the lead into the break, but as well as hoping to find more goals in the second half to secure a victory, some serious attention would need paying to the number of times Burnley had been able to get crosses into their area in the opening period. New Zealander Chris Wood replaced Jeff Hendrick for Burnley at the start of the second half as the home side looked to push another forward high up the pitch to pressure the Blues defence. Burnley gave early notice of their intentions with Wood putting Keane under pressure to win a corner before another cross from the left went through to Lennon and Pickford had to be at his best to turn the shot away for another corner. The set piece saw Mee get his header past Pickford but come back off the crossbar, the follow-up going safely over for a goal kick. Burnleys’ bright start saw them drew level in the 56th minute with Barnes confidently beating Pickford at his near post after getting beyond Keane to get on the end of a peach of a ball down the right wing channel from Lowton. Wayne Rooney came off the bench on 59 minutes to replace Tom Davies and add a bit more experience and know how to the midfield that was in danger of being swamped by a now rampant Burnley. More good work again from Lennon causing problems before finding Gudmundsson for yet another centre that fizzed across the Everton six yard area. Barnes had another chance after Lowton again worked the ball down the right as Everton continued to struggle with balls played down the flanks. Oumar Niasse became the Blues second change in the 68th minute replacing Cenk Tosun. Entering the final quarter hour, Everton finally forced their first half chance of the second session with a low cross from Walcott that eventually led to a speculative bicycle kick effort from Niasse that ballooned high over the bar. A good cross from DCL fell nicely for Sigurdsson who evaded his marker but he put his shot across the face of goal and wide. Aaron Lennon who’d been at the centre of much of Burnleys’ good work forced two more corners for the home side, the second of which was sent to the back post by Gudmundsson for Wood to easily escape his marker Williams and put the home side ahead. Yannick Bolasie was a rather bewildering 83rd minute change as it came at the expense of Sigurdsson with the travelling support immediately launching into a rendition of ‘you’re getting sacked in the morning’ aimed clearly and pointedly at Sam Allardyce. And things went from bad to worse for Everton as the hapless Williams received a straight red card for a very clear swinging arm into the face of Ashley Barnes on 86 minutes. What else is there to say about Everton under Sam Allardyce? He picked a side with two forwards and for 45 minutes they looked like they actually might get something, and had Theo Walcott made the most of at least one of his two first half chances, even a much needed away victory. But a second half of absolute dross with practically no attacking intent until the final twelve minutes saw the home side recover, draw level and eventually, deservedly, take all three points courtesy of some of the worst central defending I think I’ve ever seen. Let’s give Burnley some credit, they wanted it. 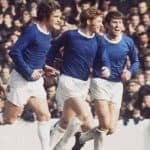 Aaron Lennon was a constant thorn in the side of the Everton defence and the number of crosses that the Burnley wide men threw into the Everton area was always likely to reap an eventual reward.